Coldwater streams are areas or reaches of streams and small rivers with water cold enough throughout the year to support coldwater fish such as brook trout. 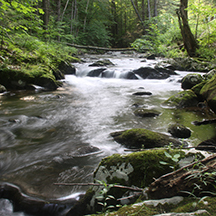 Brook trout, Atlantic salmon, and the non-native brown and rainbow trout thrive in cold water. Other species that inhabit these streams include slimy sculpin, blacknosed and longnose dace, and white suckers. The effects of climate change on the water temperatures in these streams are of critical concern.